The microscopic oak mite leaves not-so-microscopic bites when it finds a tasty human. And after last year's outbreak in Kansas City, people are worried about their return. As another growing season approaches people are rightfully concerned about the mites’ return for a third year. Johnson County K-State Extension has been asked to predict if there will be an outbreak this year. Since I don’t have a crystal ball, let me explain what we do and don’t know at this time. Let me be clear — there is no way we can predict the oak itch mites' return. We may not even know how severe the bites might be until they start to happen. The best answer is my patented “it depends.” It depends on a number of factors, some of which we know and others that we cannot predict. 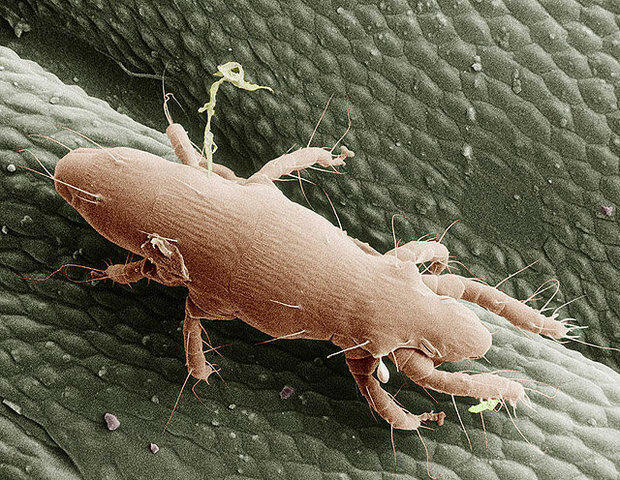 Here’s what we know about the itch mite. 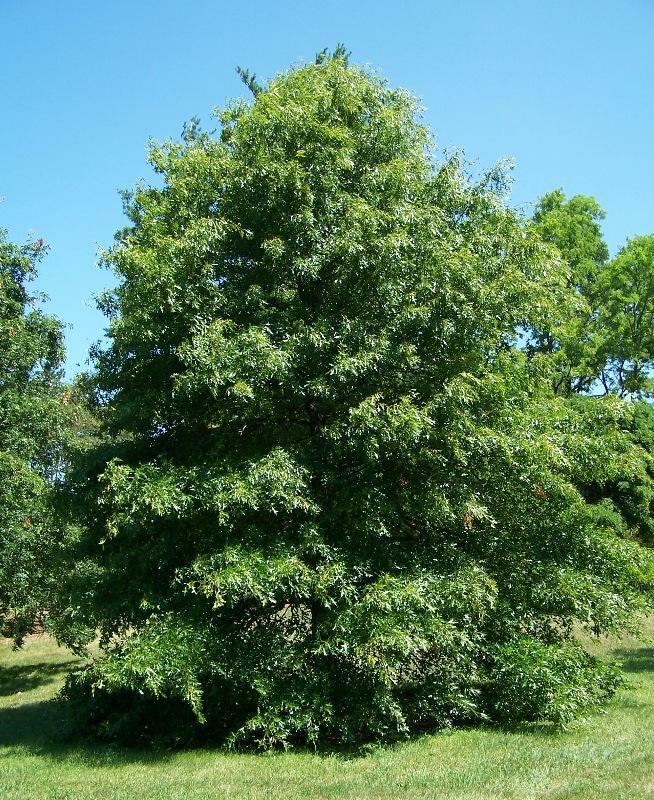 Current research has shown they feed on the larvae of insects found on pin oak trees. The most likely host is called the oak margin gall. This means there may be an “if/then” scenario. That is, if the margin gall is present in large numbers this spring and summer then it may be a link to a potential problem in the fall. 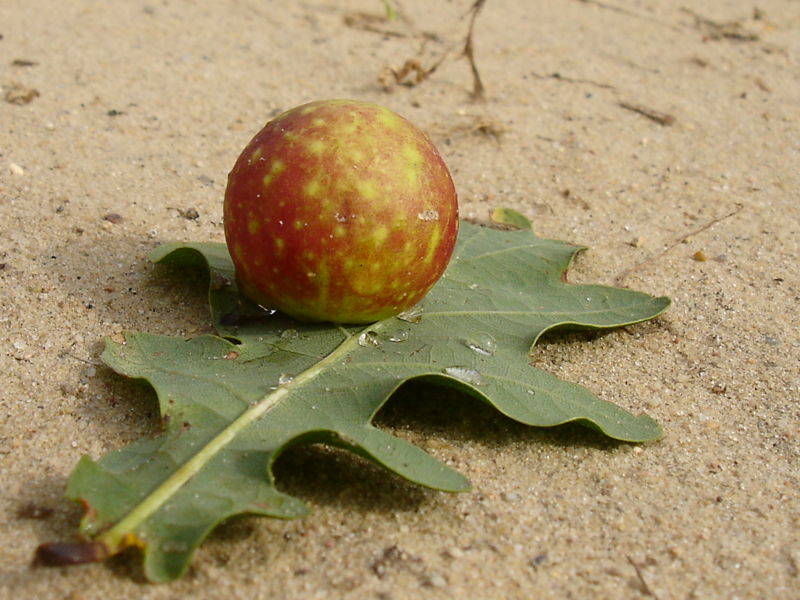 An oak gall growing on a leaf. These galls are filled with larvae that oak mites feast on. But here is where the “it depends” answer comes into play. The current thinking in the research community is the itch mite may have a wider host range than oak margin gall. Researchers are wondering if it can feed on other species of oak gall larvae, or if there are other host plant species besides oak. Then we have no way of drawing a correlation between the potential outbreak based on the number of margin galls on the trees. Talking to our Kansas State University entomologist, there appears to be little research being conducted around the country on the itch mite, even though its range has continued to spread. You might ask why there is not more research occurring. This mite is a human health issue. Well it boils down to another cliché, and that is “show me the money.” There does not seem to be funding either in the public or private sector pouring into fund top-notch research. Even if we did know the host range for the itch mite, predicting a fall outbreak in the spring still would be a guessing game. Forecasting would probably not be much better than the weatherman predicting a big winter storm a week out or even forty-eight hours in advance. There are many other environmental factors that can influence the development of insect and mite populations. We know that it takes a food source for the mite to feed and reproduce. Remember, the only host that is scientifically confirmed is the leaf margin gall. But there could be other food hosts. Factors such as rainfall, temperature and humidity can significantly affect the development of the itch mite. These are all evolving conditions over the spring and summer months. Predicting whether the oak mite will make a return for a third year in a row is a “wait and see” situation. Your best guess would be like throwing a dart at the wall without looking. You just never know if you will hit the target. Pin oak trees are the favored haunts of oak mites. We can focus on what we can do, but unfortunately the answer to that question is simple — not much. There are no practical controls or prevention for the oak itch mite. There are no pesticides that can be applied to the tree to effectively prevent the oak galls from forming on the tree. The galls are the result of a small flying insect that stings the unfolding leaf, creating the growth which is the home for its egg and offspring. That is the larvae in which the itch mite feeds. After feeding and reproducing, the mite then exits the leaf in the fall looking to find a protected location to overwinter. It is at this time millions of microscopic mites are blown in the wind, falling or landing on us. That is when they bite, resulting in the itchy rashes that are painful. Mites that don’t land on us spend the winter protected, waiting to emerge the following season to potentially start their reign of terror over again. Even if there were a control for the mite keep in mind this insect is windblown, so it can move great distances. Even if you could treat your tree they can still move down the street from other areas resulting in the bite. Everyone is looking for a silver-lining to this problem and there just isn’t one. In your zest to protect yourself don’t fall prey to schemes that are designed to take your hard earned money. Don’t waste your cash on spraying trees or the yard. Don’t waste your cash on raking up every fallen leaf or any other who-knows-what, too-good-to-be-true method someone cooks up. Keep asking the question about the itch mites return. As the weeks pass I will be better able to give you an answer. But remember you may not like the answer you get. Dennis Patton is a Johnson County K-State extension horticulture agent. This article originally appeared in the March/April issue of The Best Times. If you are one of the many in Kansas City who has found themselves scratching at large, stubborn bug bites this autumn, you may think that you have encountered a spider or an enormous mosquito. But it’s likely that you have been bitten by the oak mite.